Put your Brewers spirit on display in this Milwaukee Brewers Long Sleeve Hoodie! You'll be cozy on game day in this Milwaukee Mens Navy Blue Victory Hooded Sweatshirt. 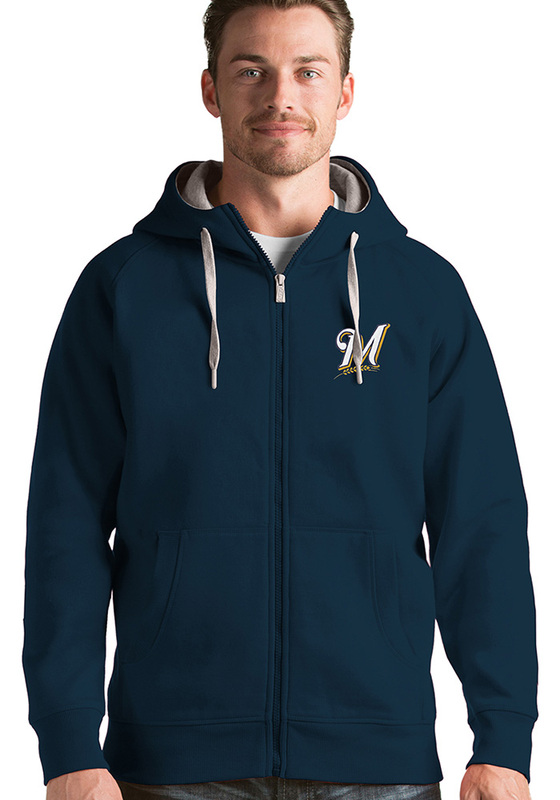 This Brewers Long Sleeve Hoodie features a 65% cotton/35% polyester jersey face fleece back pullover hood with raglan sleeves, kangaroo pocket, dyed to match coverstitch, rib cuff, & bottom hem and contrast drawcords, inside hood, & zipper pull. Antigua triangle patch at top of hood.. Wear your Milwaukee Brewers spirit with pride in this great Mens Hooded Sweatshirt!